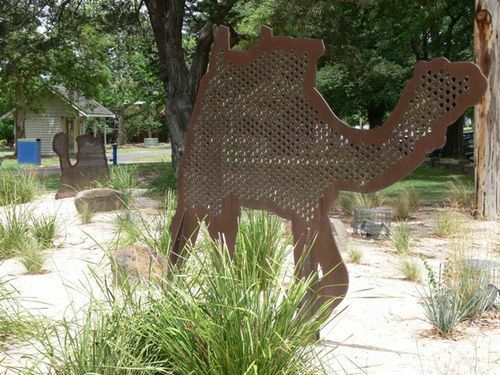 The camel sculptures were commissioned to commemorate the first camp site of the ill fated Burke & Wills expedition of 1860 and 1861. The expedition attempted to cross the Australian continent from south to north and back. Only one man survived the journey. The four camels are depicted in various modes of breaking camp. 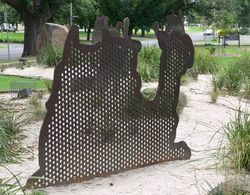 The camel designs were hand drawn and digitised, then laser cut in 5mm thick corten steel. The sculptures were completed in February 2006. 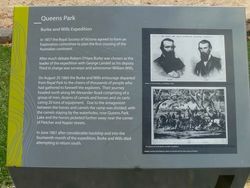 The Burke and Wills Expedition was originally called the Victorian Exploring Expedition and its aim was to cross the continent of Australia from Melbourne on the south coast to the north coast, which at the time was uninhabited white people. No one had done this before, and to the Victorian colonists the centre of the continent was unknown, unmapped and unexplored. The expedition was organised by the Royal Society of Victoria and it became the first to cross the continent. Three men traveled 5,000 kilometres from Melbourne to the shores of the Gulf of Carpentaria and then back to the Depot Camp at Cooper Creek. Seven men died in the attempt, including the leader, Robert O'Hara Burke and the third in command William John Wills. Only one of the four men who reached the north coast, John King, survived to return to Melbourne.